I am thrilled to have added my two bits about Charles Gemora to the LOST SOULS page of the Irish Journal of Gothic and Horror Studies website. One of the editors, who is also a board member over at the Classic Horror Film Board, caught me by surprise when she approached me about making a contribution to their Lost Souls section a couple of months ago. 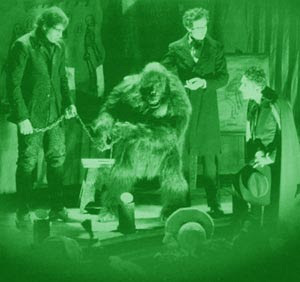 I somewhat nervously accepted - it's one thing to ramble about gorilla suits and films on my blog and the CHFB, but to have my scribblings alongside the essays and treatises of their very astute and learned contributors? Gave me a chill when I took a close look at what populated the pages of the Journal. Family and work held me back from getting down to brass tacks but I was given some extra time and for that opportunity I am greatly appreciative. The challenge to meet another's expectations only serves to sharpen your focus and I think the piece is one of my better tracts on gorilla suits. I hope you will saunter over and have a read. The other materials posted are also quite stimulating! I am indebted to Bob Burns and Tom Weaver for making a very personal record of Charlie's genius and also, to his daughter Diana, whose tales of her father's antics and adventures only sharpen my craving to know more of the man. Charles Gemora was more than just a guy in a suit and as humble as he was, he deserves our admiration and respect.